The Great Shrine of Amaravati was one of the most important Buddhist monuments in the world. Curator Imma Ramos explains the long history of this sacred site, and how we're using new technology to help people find out about the people who funded its construction. Detail from a limestone relief, showing an image of the Great Shrine itself and the Buddha in bodily form, c. AD 250. 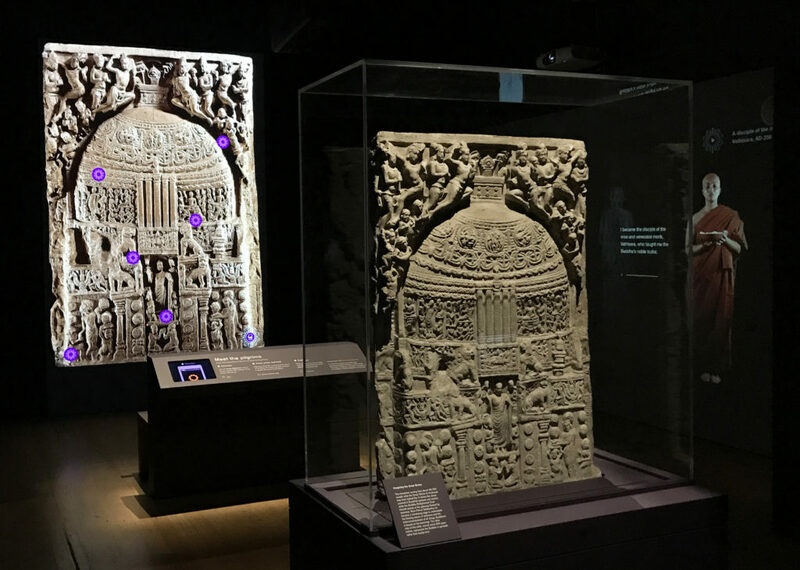 The Asahi Shimbun Display Virtual pilgrimage: reimagining India’s Great Shrine of Amaravati focuses on a double-sided relief from a shrine in south-east India. Founded around 200 BC, the Great Shrine of Amaravati was one of the earliest, largest and most important Buddhist monuments in the world. The Asahi Shimbun Display Virtual pilgrimage: reimagining India’s Great Shrine of Amaravati. Located near the ancient city of Dharanikota in the present-day state of Andhra Pradesh, the site flourished for over a thousand years. The city had important trade links throughout South and Southeast Asia, Sri Lanka and the Mediterranean world. The Great Shrine’s domed structure, or stupa, contained a relic, perhaps of an important spiritual teacher or of the Buddha himself, who died sometime between 490 and 400 BC. The site was gradually abandoned during the 14th century, and by the late 18th century materials from the Shrine were being recycled for new buildings and temples. In the 19th century a series of archaeological campaigns recovered the surviving sculptures. Today, the pieces are shared across a number of museum collections in India and around the world. 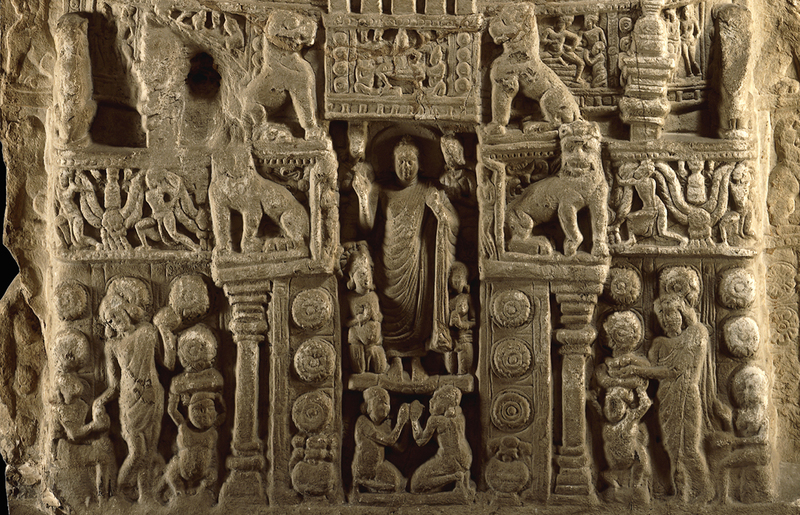 The British Museum’s collection features over 120 sculptures from Amaravati, the single most important group of Indian sculptures outside the subcontinent. 3D model of the Amaravati double-sided limestone relief on Sketchfab. One side of the relief on display, carved around 50 BC, shows devotees gathering around an empty throne with their hands clasped in gestures of reverence, while heavenly figures hover above. In the foreground are footprints, and rising behind is a Bodhi tree, under which the Buddha attained enlightenment. These three symbols evoke the Buddha’s presence. 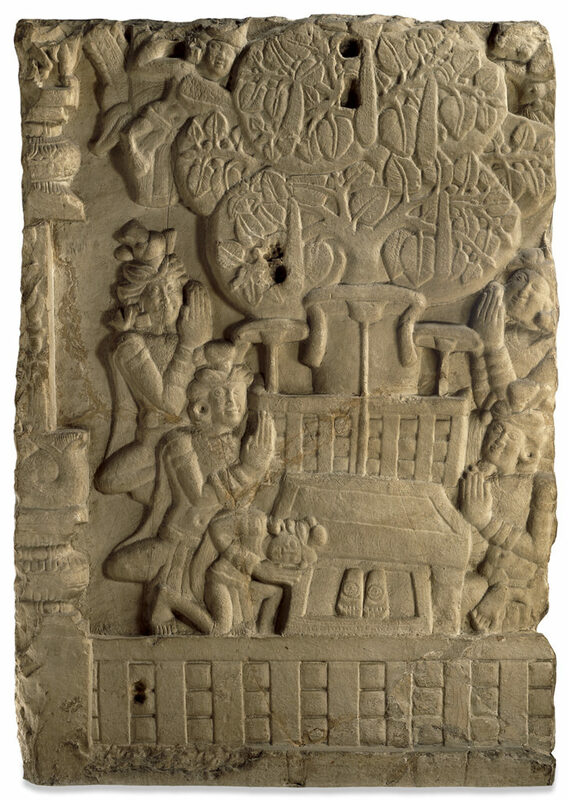 When this relief was carved, symbols may have been used because it was believed that the Buddha liberated himself from the earthly realm, never again to be reborn within the confines of the human body. One of two sides of a relief from the Great Shrine of Amaravati, evoking the Buddha’s presence symbolically as an empty throne, a Bodhi tree and a pair of footprints, c. 50 BC. Around AD 250, during a major renovation, the relief was turned over and the stone reused. Recycling materials ensured the gifts of former donors continued to benefit the development of the site. The later side was carved with an image of the Great Shrine itself, revealing what it may have looked like. It shows the dome covered in Buddhist symbols and stories, while the Buddha himself stands in bodily form at the gateway, flanked by devotees. Detail of the later side of the relief, showing an image of the Great Shrine itself and the Buddha in bodily form, c. AD 250. Pilgrims from many walks of life funded the construction and adornment of the Great Shrine over hundreds of years. Donations (dana) were a way of attaining spiritual merit (punya) in this life and the next, ultimately bringing devotees closer to enlightenment or Buddhahood. According to the Buddha’s teachings, anyone could achieve this state of bliss, regardless of social background. The identities of these donors are revealed through Prakrit inscriptions written in Brahmi, one of India’s oldest scripts, carved onto individual sculptures. Permanently engraved on stone, they allowed devotees to remain close to the Buddha’s presence at the Great Shrine. They include an inscription carved above the 3rd-century side of the relief which says that it was the gift of a female disciple (amtevasikini) of the venerable monk (bhadamta) Vathisara, who lived in an unidentified place called Kurera. This inscription, worn and damaged over time and almost illegible, was recently translated for the first time. I am grateful to Vincent Tournier and Arlo Griffiths for producing a preliminary transcript and for explaining its meaning. The display explores the identity of the female disciple, along with the donors of other sculptures in the collection. These include a 1st-century BC perfumer called Hamgha who, along with his sons and daughters, donated a pillar, a 1st-century AD Buddhist monk called Budhi who donated a ‘lion-seat’ (probably a support for a lion statue) with his sister Budha (a nun), and a 2nd-century AD woman called Kumala who, along with two other women called Sagha and Saghadasi, donated an elaborately carved railing pillar. In the display these four individuals are dramatically brought to life by actors and projected onto the gallery walls. Using new mobile technology, you will be able to use your smartphone to interact with these characters and to reimagine the donors that made the Amaravati site possible. 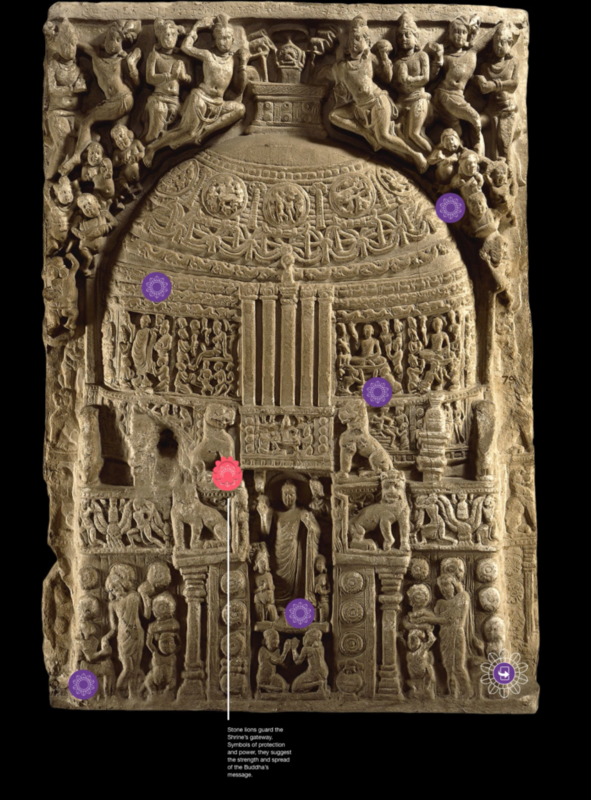 The annotated relief in the display will unlock more information about the object. This creative approach to storytelling enables us to highlight the importance of ancient inscriptions which are crucial for understanding the historical and social significance of sites such as the Great Shrine. ‘Opening up’ the gallery walls has allowed us to playfully experiment with its otherwise protected and untouched surfaces. The Asahi Shimbun Display Virtual pilgrimage: reimagining India’s Great Shrine of Amaravati, supported by The Asahi Shimbun, is in Room 3 from 10 August to 8 October 2017. Buy our detailed research publication to learn more about the Great Shrine of Amaravati.